All preschool students must be completely toilet-trained. Students must be three, four, or five years old on or before September 30th of the year in which they are entering. Students who are transferring from other schools must provide copies of their academic records for review. 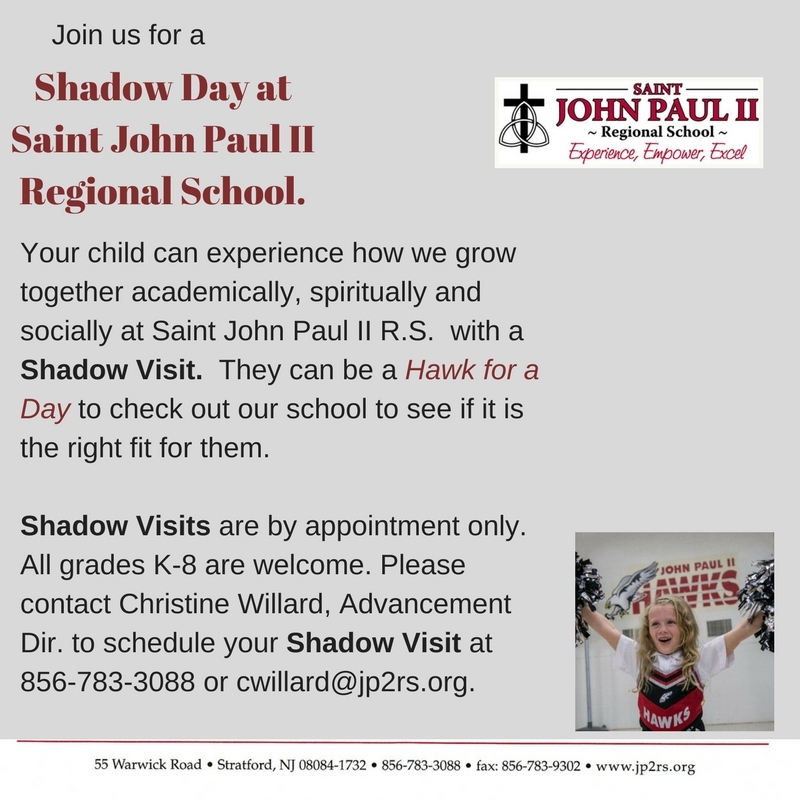 Please call our Advancement Director, Christine Willard at 856-783-3088 or email cwillard@jp2rs.org to arrange a personal tour of our campus. Step 2: Schedule an interview. Admission in Grades 3-8 requires a meeting with our Principal to review academic records and reports. This does not apply for Preschool, Kindergarten and Grades 1,2. Once accepted, submit a completed Registration Form along with the $100/child non-refundable registration fee. You may complete this step on-line or submit a paper copy. Step 4: Submit required documents. A copy of birth certificate, baptismal certificate (if Catholic), copy of most recent report card and I.E.P. (if applicable),and copy of health records are mandatory and should be submitted with registration. Step 5: Apply for tuition assistance, if needed. To apply for tuition assistance, complete the FACTS Grant and Aid application online. Step 6: Set up a Tuition Payment Account through FACTS online.